The side dish featured here includes portobellos, but it’s really the red rice I want to showcase. I’ve prepared it the “authentic” way of soaking-squeezing-draining and, truly, it changes the way you’ll look at any rice recipe forever. It’s time-consuming and some patience is required, but I do think you’ll be impressed. This is not a technique you want to use every day; just when you decide to go the extra mile. Plus, it’s nice to carry on traditions passed down for generations. Some controversy exists in preparing rice this way. First, it can wash away nutrients if you’re using “fortified” rice. Second, it may remove some starch, but long-grain white rice, after the hulls are removed is starchy right to the core. Some believe that in the old days, this method eliminated dust and bugs when large quantities of rice were stored. Those who go through the motions will swear that rice is fluffier, won’t clump, and takes on a different texture. It does! Through the squeezing and draining and re-soaking, rice begins to break up, resulting in pellets that resemble couscous. After this first step, the rice must be fried, continuously stirring, until it turns a golden brown. At this stage, a simmer with fresh tomatoes, onions and broth let it puff up. A nice steam for about 40 minutes and it’s done. When you’re enjoying the final product, you’ll be richly rewarded. You can enjoy it in a number of ways, from tortillas to a heaping portobello as I’ve done here. 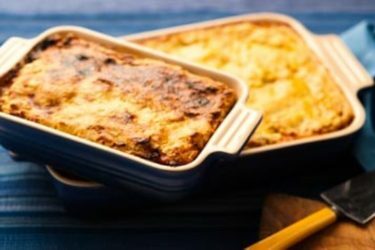 As a side, it can go with any meal. Go ahead and make a large batch; it reheats, too. 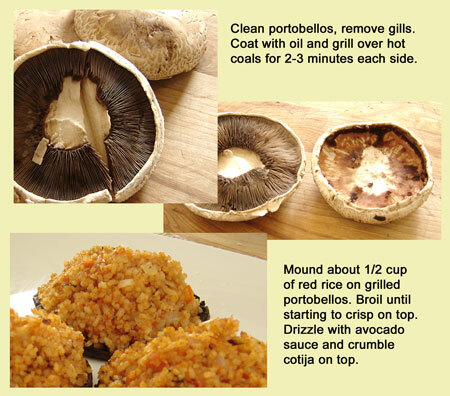 I’ll show you each step for the rice, a look at the portobellos, and finish off with a temptingly tasty avocado sauce. 1. Soak rice in hot water for 15 minutes. 2. 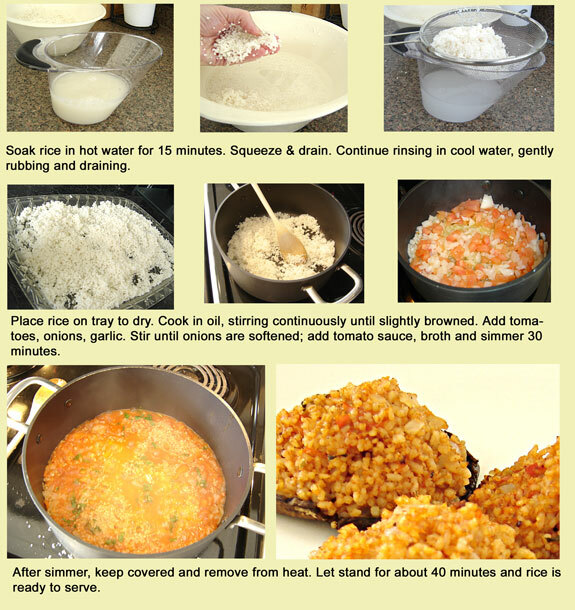 Squeeze rice and drain. 3. Fill with cool water and continue rubbing and draining until water begins to lighten. You can repeat this as many times as you wish, but at least 8 rinses. 4. After final rub and rinse, spread on a platter to dry – about 2 hours (this reduces oil splatters). 5. Dice onion, tomato and pepper. Chop cilantro. 6. In a large pot, heat 3 tablespoons oil. 7. Add rice and stir constantly until it begins to brown, about 15-20 minutes. Be careful not to overcook. 8. Preheat broth in microwave and add to rice. 9. Add tomato sauce and stir. 10. Let the mixture come to a boil and simmer briskly, covered, for about 5 minutes. 11. Remove from heat and let covered rice steam for about 40 minutes. 1. Gently rinse portobellos and scoop out the inner gills. 2. Coat with oil and cook over a hot fire, about 2-3 minutes each side. Can also broil in the oven. 3. Remove and let cool. 4. 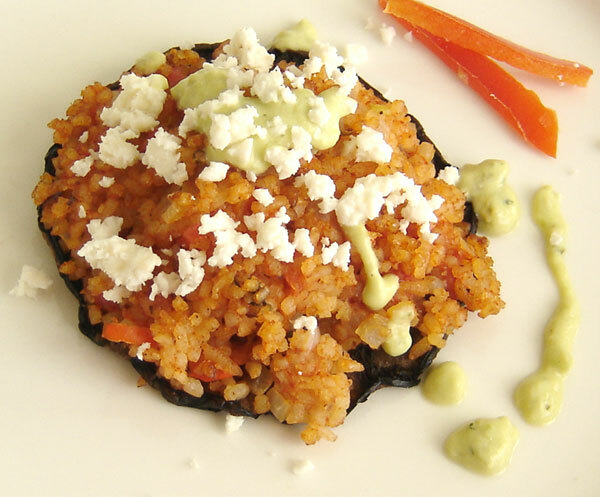 Mold about ½ cup of red rice on top of each portobello. 5. Broil until rice begins to brown. 6. 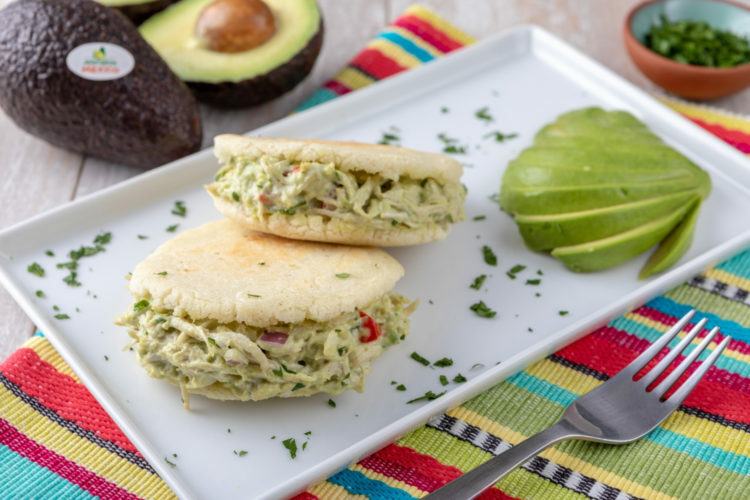 Remove, drizzle avocado sauce and top with crumbled cotija. 1. Remove tomatillo husk and boil for about 3 minutes. Remove cores after cooling. 2. In a small pan, combine remaining ingredients and cook on low-medium heat until blended.